The Teardrop Basket is handcrafted by artisans of the Peace Baskets Cooperative using the same age-old techniques found in Rwanda’s national museum. Lightweight and delicately woven, this basket makes a beautiful display piece, or can be used to store various treasures! The Peace Basket artisans partner with an expert bamboo weaver who learned from his father before him. The bamboo weaver creates the inner frame for the basket, and then the grass weaver creates the beautiful exterior. So this is a two-stage, two-artisan basket. And the coloring process is amazing! Pascasie, the cooperative founder, taught us that the grasses are colored using a banana flower as an applicator. The flower’s blue sap bonds with the soot from the bottom of a cooking pot to color the grasses black. The rust color comes from the dust of a local rock, applied to the grasses with the banana flower. We love sharing this beauty with you from the heart of Rwanda. The teardrop basket’s beautiful design is reminiscent of the layers of sloping hills that make Rwanda’s landscape so gorgeous. Crafted from valley grasses woven over a bamboo frame. Care: Dust gently with a smooth, dry cloth. 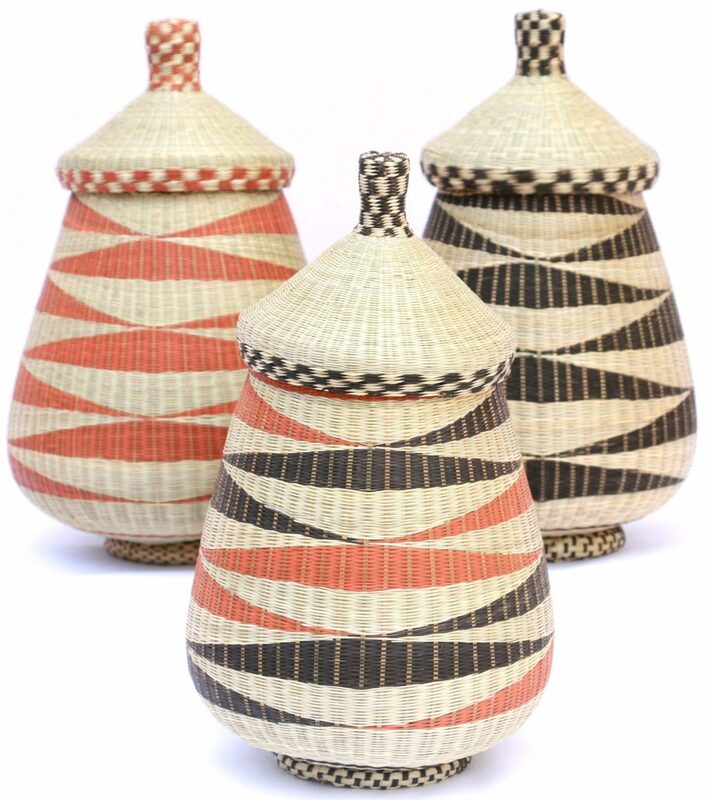 The artisans of Agaseke k’Amahoro weave Traditional Grass Peace Baskets. The cooperative, born from the turmoil of the genocide, is comprised of neighbors from both sides of the conflict, working together for peace and reconciliation. Their vision is to promote peace within and outside their group as they practice their art for their livelihood. “We must continue to work for wholeness.